Phenom Penh is a city I was told I would dislike; co-workers and acquaintances here in Hanoi told me that once I had seen the killing fields, there would be nothing else to see so I might as well head south to party hotspot Sihanoukville or tourist hotspot Siem Riep. Phenom Penh was wonderful. Its pace is slower than that of Hanoi; drivers actually waved me across the street rather than dodging me by mere inches. People smiled gorgeous big smiles, were friendly and gentle, a stark contrast to Hanoi’s aggressive, often cold, capitol city mentality. The city is by no means paradise, however. After the Khmer Rouge, secret bombings by the USA and thirty years of war that left the country so riddled with mines that Cambodians are still being harmed, how could the country not face the immense problems associated with reconciling and rebuilding? I plan to post many pictures–I took close to 700–but I would like to start with some that are more positive, rather than just focus on genocide and the Khmer Rouge. Additionally, I’ve read quite a lot about Cambodia so I will post a list of books, films and online resources so you can learn more if you’re interested. We were never allowed to play like this as kids. One of the things I love most about living in Asia is that while people really do value their kids, risk is more tolerated. 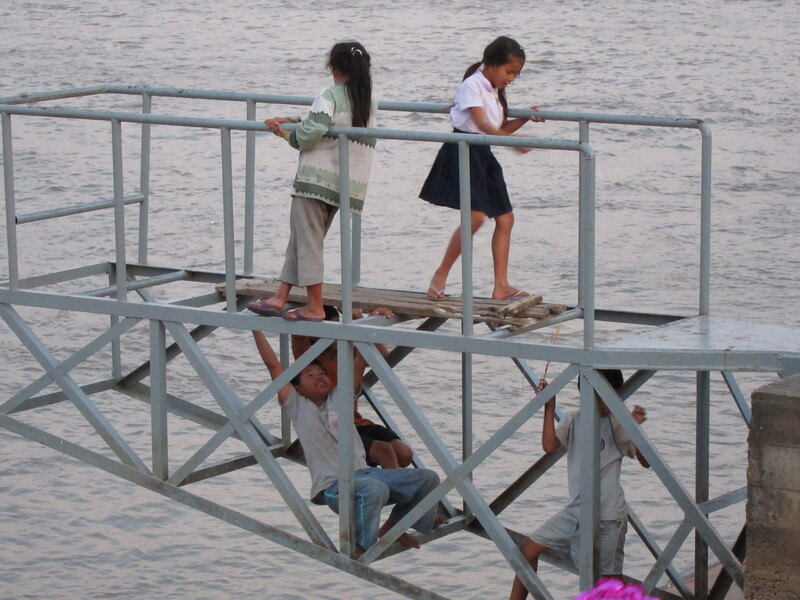 Kids play in the street or, like these children, on a bridge to nowhere over a river. When you don’t have monkey bars and balance beams, you make your own. 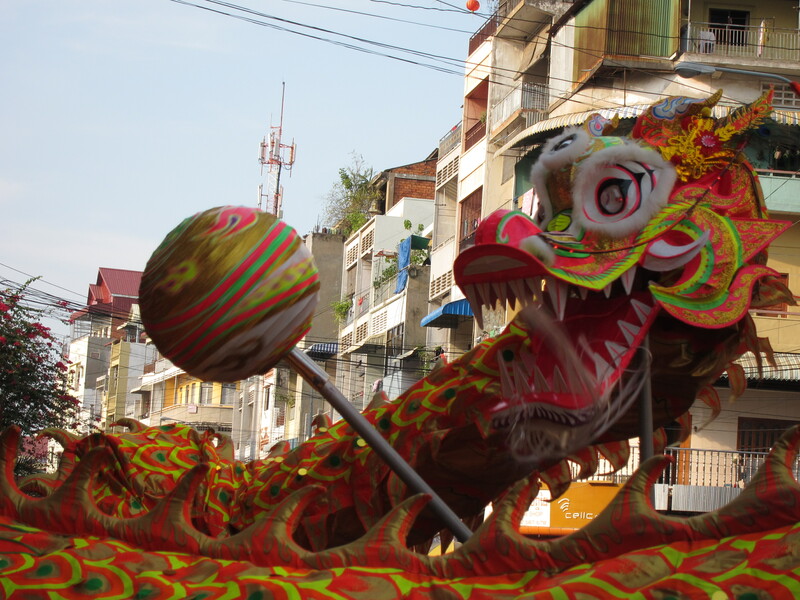 Cambodia has a large Chinese population so Chinese New Year is celebrated by many, much the way it is celebrated in Vietnam. I was fortunate to stumble upon a dragon/lion dance while I was wandering around the city. 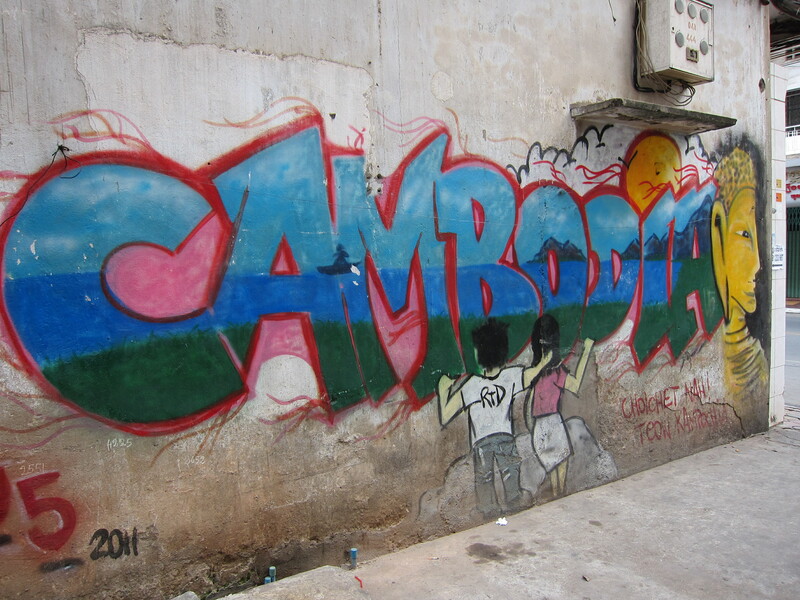 Life is art and Cambodia was filled with it, from graffiti to palaces to dance and the ancient temples of Angkor. 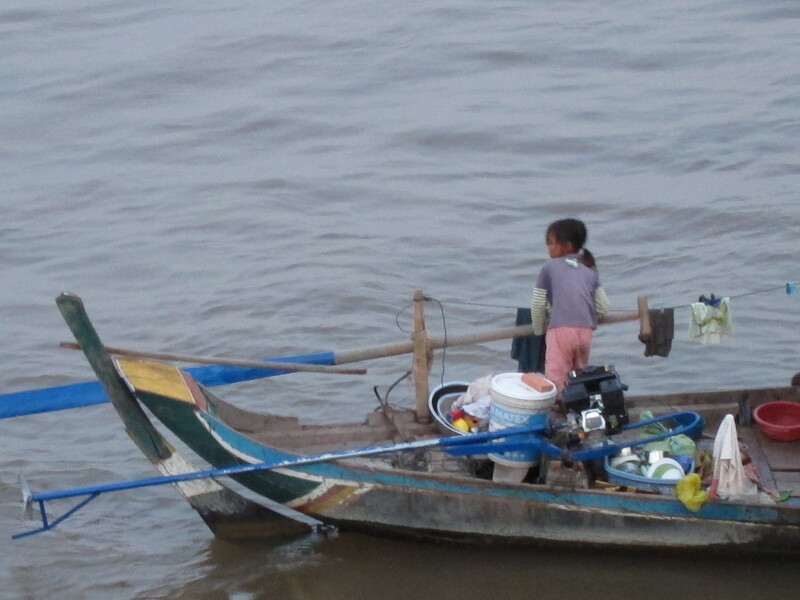 This boat (I think it was a houseboat) was tethered to the bank of the river as this little girl pretended to row upstream toward the Mekong. 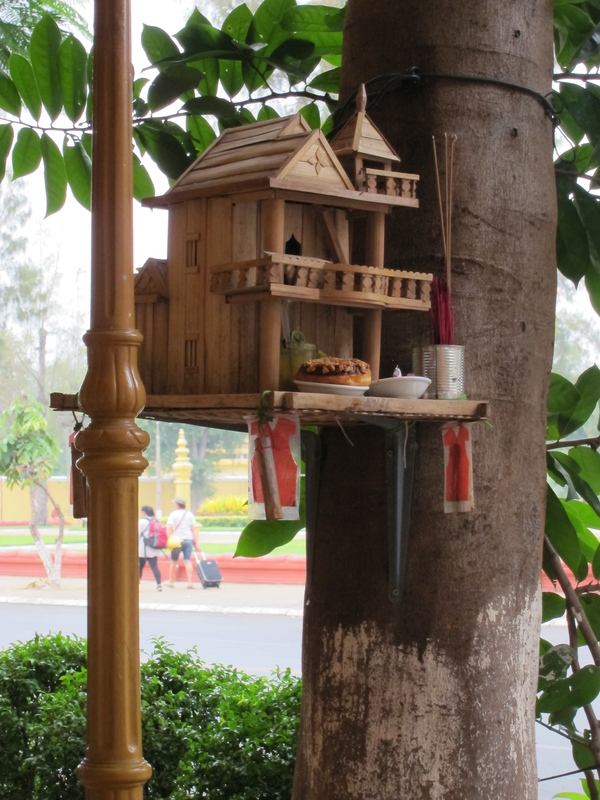 Homes and shops in Cambodia frequently have spirit houses in front of them. Offerings are made and incense sticks are lit each morning to keep the spirits happy and bring good luck. Sometimes, even the ancestors need a doughnut. In SE Asia, I think how you perceive cities depends on what cities you’ve already seen in the region. I went to Phnom Penh after Siem Reap, so it seemed a bit hectic. But when I look back, overall, it was so much more friendly and less busy than Hanoi. I know people avoid Phnom Penh because of the history, but I think it’s important to see it. Phnom Penh seems to me like it’s a city in the process of rising, however many issues there still may be. I actually thought the scene in Sihanoukville was more depressing… it came across as such an empty, dirty, and shady town full of foreigners who exploited locals (I saw more older men with young wives there than any other stop on that trip). Of course it’s been awhile since I visited, so things may have changed. That’s a really thoughtful reflection. I very much got the sense that Phnom Penh was a city on the rise. As Cambodia continues to heal from war and as its economy improves, I think Phnom Penh will become a really desirable place to visit or live. I’d love to go back there again while I’m living in the region. Cambodia’s population is so young that I think the country has a lot of potential, despite the challenges it faces in terms of poverty, poor healthcare and education not to mention that landmines still affect much of the country. I actually didn’t visit Sihanoukville for the very reason you describe. I thought I wouldn’t enjoy it and the impression I’ve gotten from other travelers is that the partying and cheap drugs are great–those just aren’t my thing. Apparently, it has nice beaches but there are other parts of Cambodia that supposedly do as well. I’ll have to go back in order to check them out.